Western North Carolina golf communities offer a prestigious mountain lifestyle with championship resorts and luxury golf properties with resort amenities. Are you looking for a golf property in a master planned community from Asheville or Lake Toxaway or in Hendersonville? If the answer is yes then make sure you are working with a Realtor at Exit Mountain Realty. If you’ve heard of the community we are familiar with it. Just a few opportunities you will have: High Vista Country Club, Kenmure, Champion Hills, Cummings Cove, Laurel Park, Lake Toxaway, Glen Cannon, and Connestee Falls. Living in a golf course community in North Carolina stands for year-round golfing among the scenic beauty of the Smoky Mountains, Blue Ridge Mountains, and the Pisgah National Forest. Property values are higher in a prestigious community of golfing amenities. Golfing communities contain customized homes that feature views of the course, park like settings with manicured green courses, tree lined courses and man made lakes. Golfing homes that surround golf course communities include single family homes, estates, townhomes, condominiums, and luxury apartments. Amenities abound in golf communities near Hendersonville come in the form of other activities like tennis courts, swimming pools, hot tubs, fitness centers, boating, top restaurant dining, cafes, bars, pro shops and a luxury clubhouse. 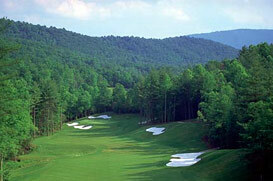 The Lake Toxaway golfing community is located in western Hendersonville. Lake Toxaway has 14 miles of calm shorelines and is the largest private lake in North Carolina. It is ideal for swimming, fishing, boating, water skiing, and windsurfing from dawn to dusk. Its scenic properties include the greenery forests of nearby mountains. The Lake Toxaway Resort has entertained renowned names such as Edison, Firestone, Ford, and Rockefeller. Lake Toxaway properties include private properties with balconies that overlook amazing waterfalls, horse farms, and massive private estates whose backyards are part of national and state forests. Residents and visitors enjoy amenities like swimming, water-skiing, canoeing, fishing, 18 hole golf courses, courts for various sports, and Lake Toxaway Country Club benefits. Lake Toxaway has a growing economic base which is why entrepreneurs and families are moving into its neighboring subdivisions. High Vista Country Club is an exclusive semi private neighborhood who opens its door to professional golfers, golfing enthusiasts, non golfers, residents and the public. Its panoramic scenic views from its Chestnut Top mountainside location, gives its residents a spectacular view of the Blue Ridge Mountains, Mills Knob, Caney Mountains and the lush valley between their peak. Golfing is king in the High Vista Country Club environment, but this gated community also provides town homes, condominiums and single family homes in and around the golf course. Other attractions within the High Vista community includes: tennis, playgrounds, large swimming pools, picnic grounds, social gatherings, hiking trails, fishing, boating, and the annual High Vista BBQ and huge fireworks display around a lake. Kenmure is North Carolina’s premiere gated golf community and resort. It is located in the community of Flat Rock of the Blue Ridge Mountains. Kenmure is 4 miles south of Hendersonville and has been voted one of the “Top 50” golf courses in the southeast region. The architecturally designed, single family homes in Kenmure blend into the rustic setting of the Blue Ridge environment. The residents of this gated community are why it is a serene and beautiful location to live, raise a family and to play. Kenmure has year round mild weather, upscale shopping, dining, art galleries and annual festivals. Its par 72 – 18 hole golf course offers golfers of all levels, daily playing opportunities. The Kenmure Country Club offers indoor and outdoor swimming pools, state-of-the-art fitness center, top chef restaurant, and little tot playgrounds. We are happy to help with your purchase of a new golf course home, condo or villa. When you’re talking about a luxury golf course home or lot, home for sale, condo for sale don’t leave your future to chance. Make sure you have a Buyer’s Agent from Exit Mountain Realty. If you’ve heard of the community we are familiar with it.